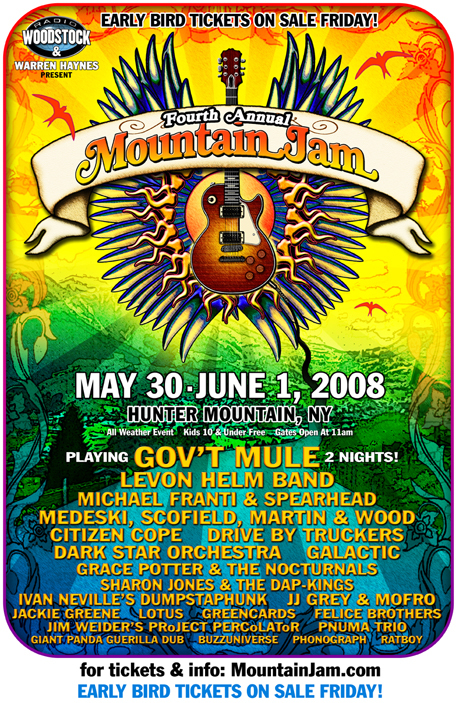 The line-up for the fourth Hunter Mountain Jam was announced yesterday, and after I got over the déjà vu – it’s now a given that Government Mule close out both nights, and weren’t Spearhead, and Medeski, Scofield, Martin and Wood on last year’s bill too? – I got quite excited. The line-up includes the best of what we have to offer locally from across the generations, including veteran Levon Helm and newcomers the Felice Brothers, and at least a couple of current buzz acts: Galactic and Sharon Jones & the Dap Kings. Throw in the Drive By Truckers and Citizen Cope and it’s not a bad line-up, at least not if you live within a half-hour drive. (Besides, nobody says you have to watch every one of the great unwashed jam bands who make up the rest of the bill.) Tickets go on sale this Friday. The betting that it will rain through the event for at least the fourth year in a row starts now.